Something I don’t often talk about is my food intake and maintaining a healthy lifestyle. I do the weekly shop and prepare all our meals at home, so basically when I’m eating healthy so will my family. I really enjoy eating a nutritional diet because it genuinely helps me feel better. 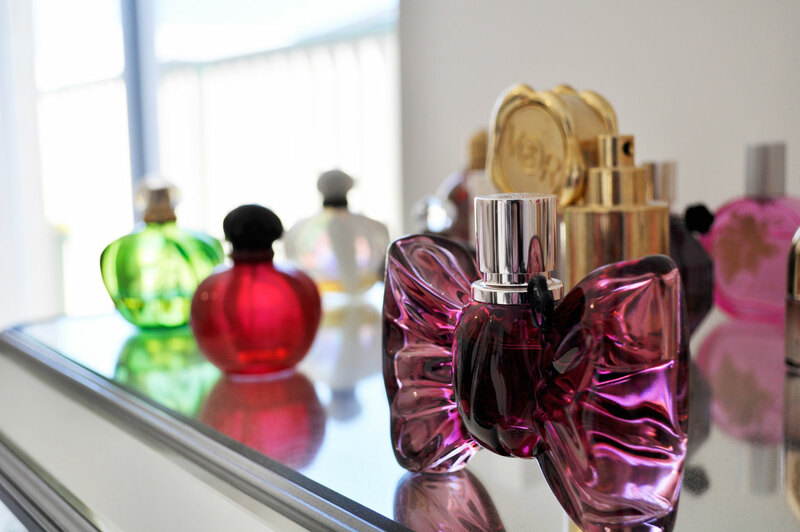 It influences my mood, boosts my energy levels, and it generally improves my wellbeing. There have been countless times where I have felt sluggish and irritable after a cheeky Maccas or greasy KFC. Don’t get me wrong the convenience of fast food can be alluring and it is nice to treat the family from time to time but if we are consuming good food we will be healthy, if we eat bad food in excess we will be unhealthy. We are what we eat… am I right? Let’s go back six years ago when my first child was born. My mum bought us a baby bullet blender to prepare his meals for when he was ready for solids. That is when my love for clean eating began, I would make a banana and spinach puree for him then a fruit smoothie for myself afterwards. Six years on and we’re all still enjoying our yummy drinks. I also like to include different types of raw organic protein powder to boost my smoothie’s protein intake. 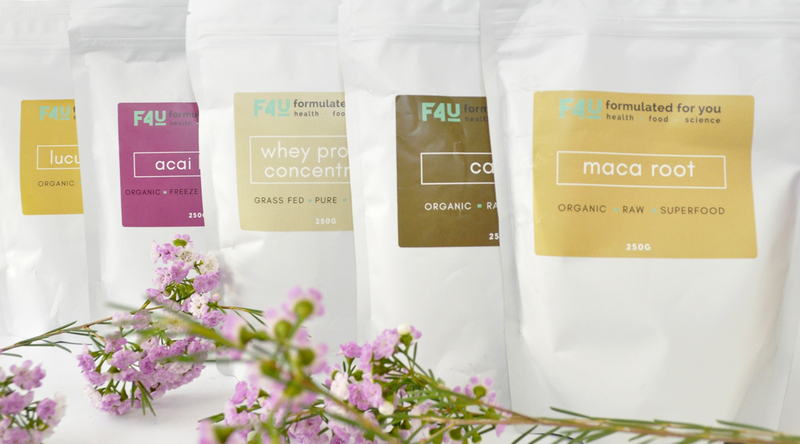 Formulated For You (F4U) is an Australian health food company who specialise in a range of nutritional protein shakes and smoothie booster powders made from organic ingredients. 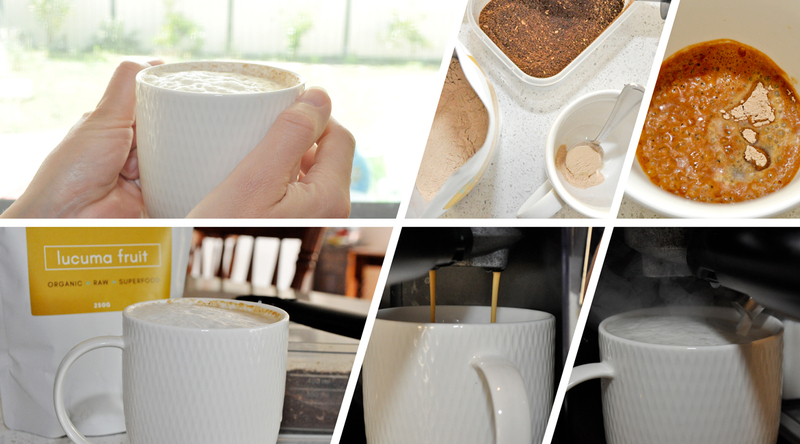 They formulate wholesome and functional ingredients in their blends with no nasty additives. Instead of using “fillers” which are cheap ingredients, often used in other meal replacements to “fill” recipes, their focus is on nutrient-density and high-quality ingredients. Filler ingredients to avoid may include Milk Solids/Full Fat/Skim Milk Powders, Fructose, Glucose Syrups/Corn Syrups, Maltodextrin, Dextrose. Whey Protein Concentrate (10 serves), Organic Raw Cacao Powder (25 serves), Organic Maca Root Powder (50 serves), Organic Lucuma Fruit Powder (50 serves) and Organic Acai Berry Powder (50 serves). 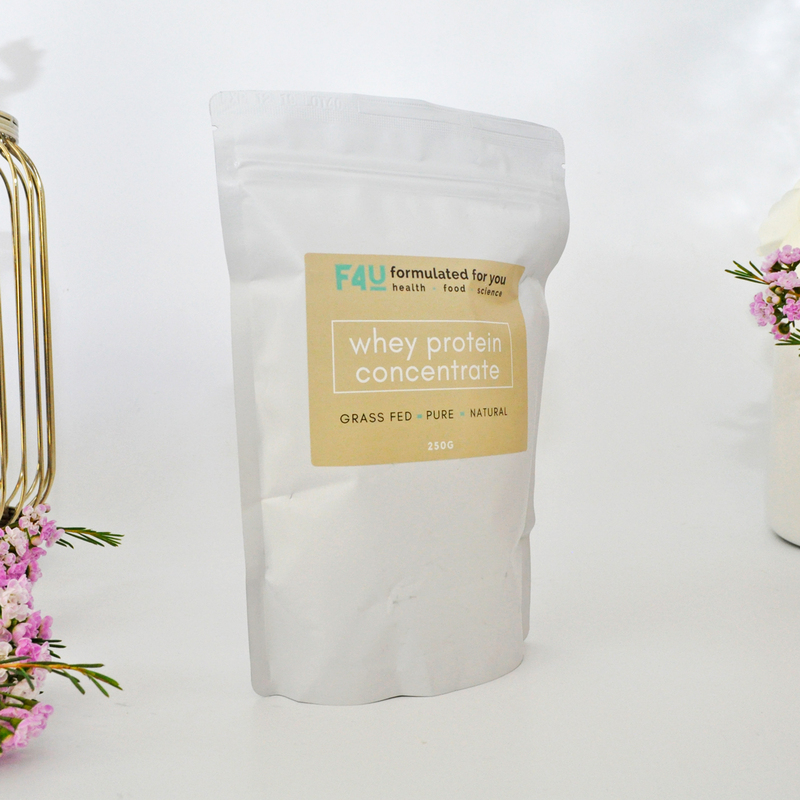 F4U Whey Protein Concentrate is an excellent protein source for tissue building and repair. It is an unflavoured, unsweetened and natural product sourced from grass-fed cows in Victoria, Australia. You can mix it with water or milk, but it tastes creamy and delicious added to a smoothie or baking recipes. 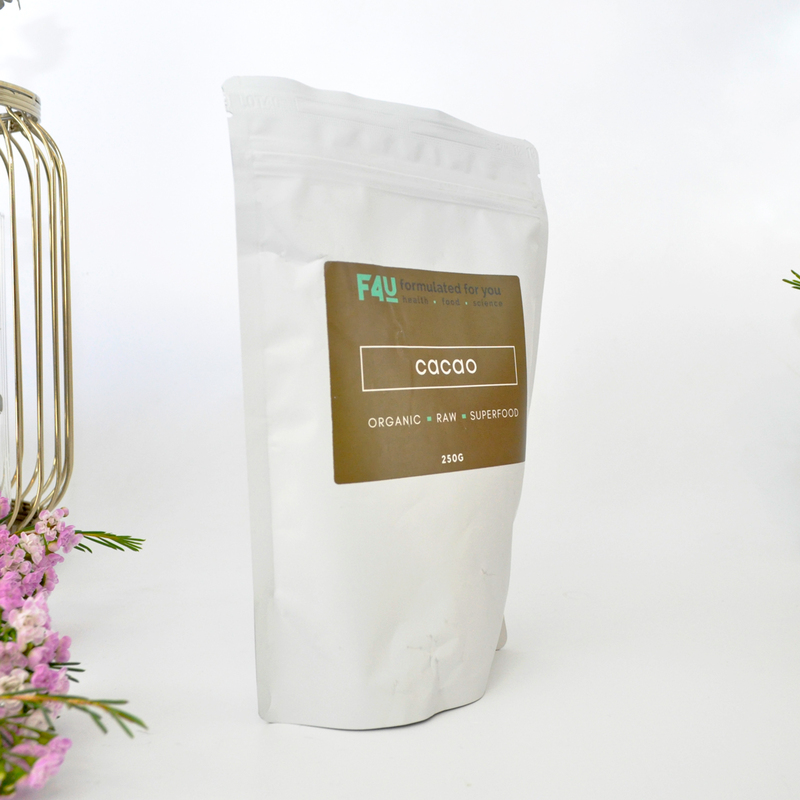 Raw Cacao powder is an organic and natural “superfood” which provides a balanced source of energy thanks to all the macronutrients and antioxidants that help keep us energised, happy and healthy. Did I mention it tastes pretty amazing too? 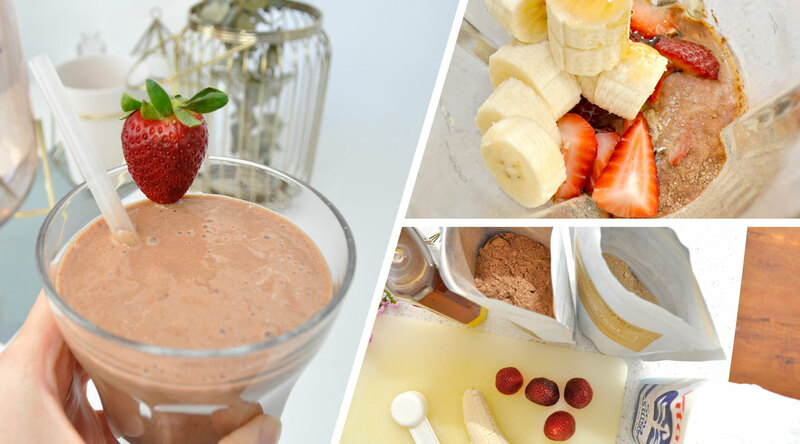 It is the perfect addition to any smoothie blend or healthy chocolate baking recipe. 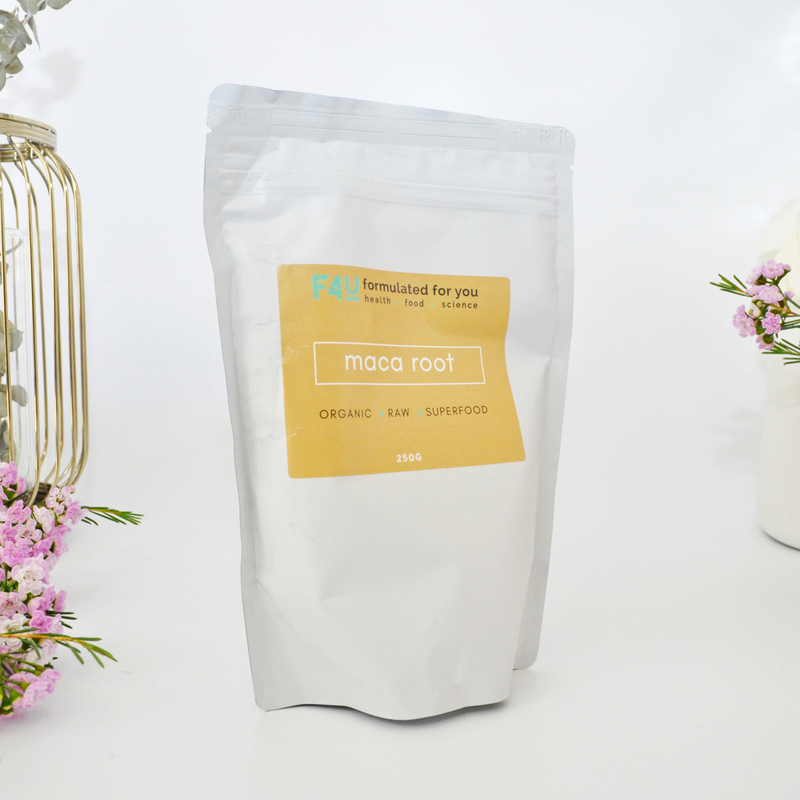 Maca is a root vegetable with an earthy, malt-like flavour traditionally used to enhance mood, memory, balance hormones and stabilise blood sugar levels. I love adding this nutrient dense powder to my cereal or smoothies in the morning, and I think it tastes utterly delicious combined with cocoa powder too. What I’m about to type may sound a bit odd but I’ve been adding a teaspoon of Lucuma Fruit Powder in my coffee each day. 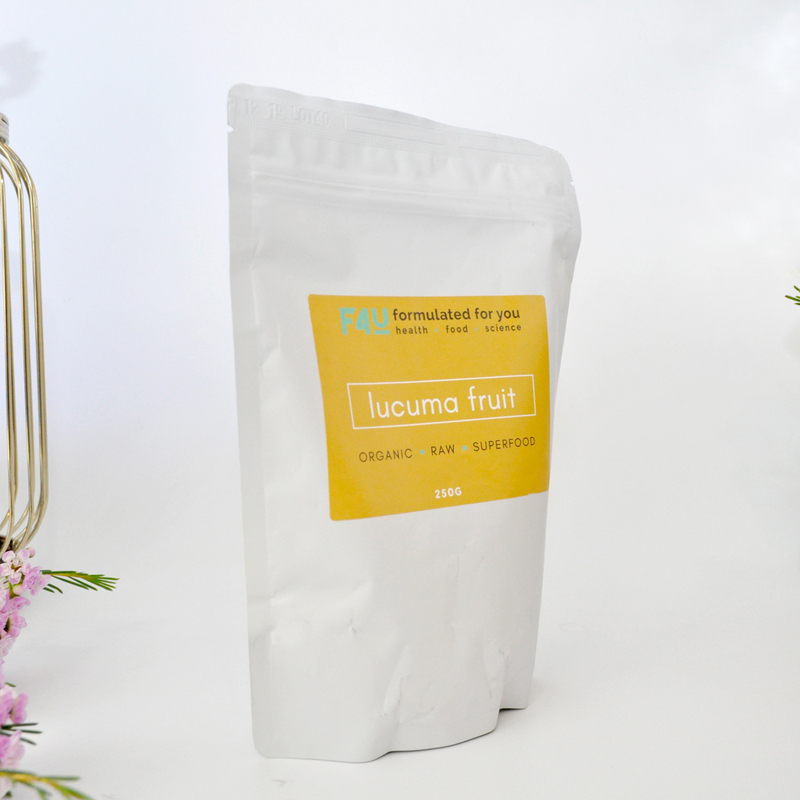 I have been looking for a natural sweetener to replace my sugar cravings and I think I hit the jackpot with the exotic sweet maple taste of the Lucuma fruit powder. You can add it in baking recipes or smoothies for a sustained (Low Gl) release of energy to fuel your body for longer. This anti-oxidant rich superfood is concentrated with nutrients for optimal energy, skin health and digestion. 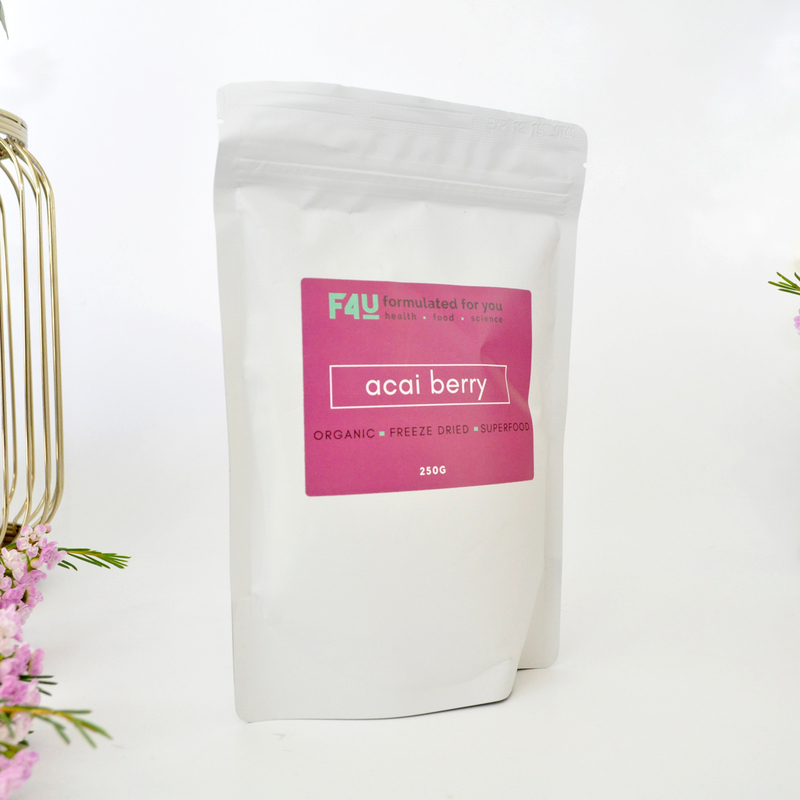 F4U Acai berry powder is freeze-dried, certified organic with no added flavour, colour or sweetener. I have been making healthy breakfast acai bowls on the weekends for hubby and I. This acai berry powder makes the tastiest protein-packed liquid meals, perfect for a family of smoothie lovers. 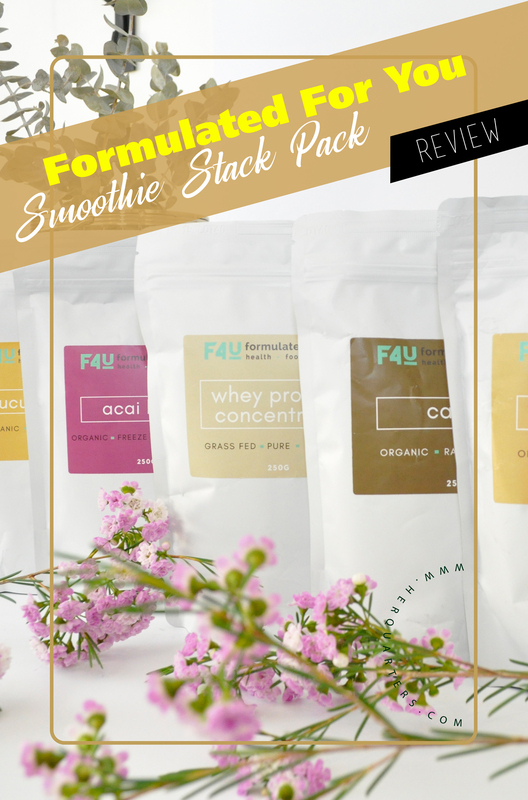 Price: F4U Smoothie Stack Pack | $90.00 AUD available online at https://formulatedforyou.com.au – Formulated For You (F4U) Smoothie boosters provide a healthy dose of nutrition to supercharge any healthy beverage. 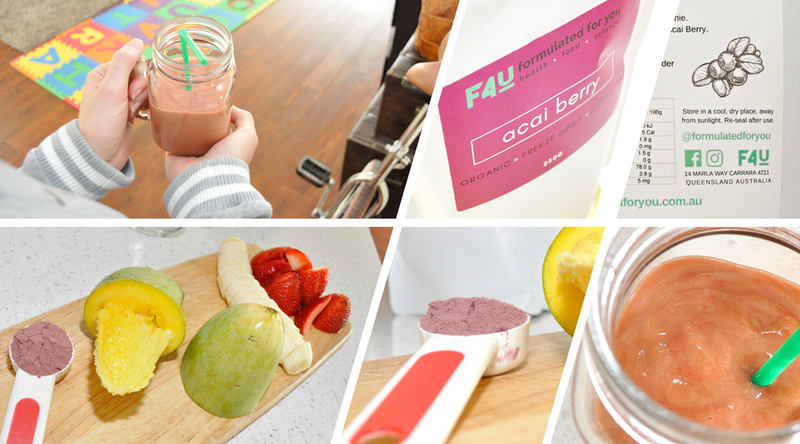 Have you tried Formulated For You Smoothie Boosters yet? 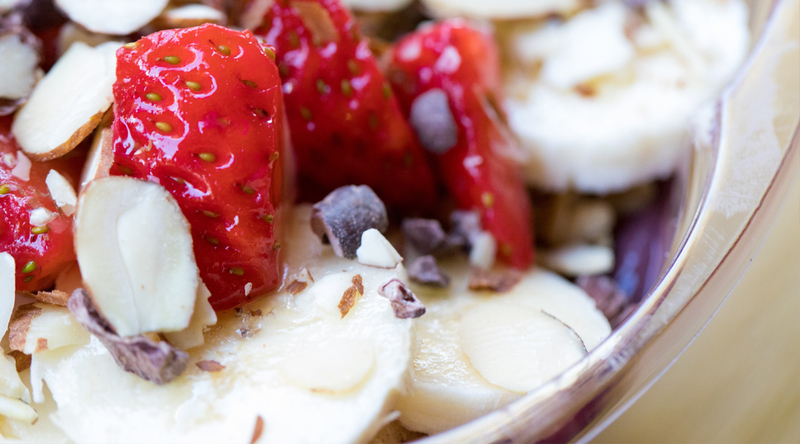 How do you take your smoothies to the next level? Let me know in the comments below. Thank you Emmalisa for your lovely feedback! 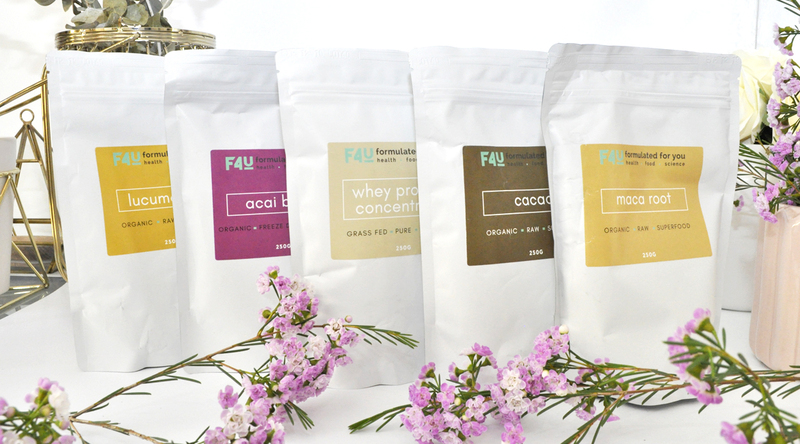 I am so keen to try F4U’s meal replacement packs next. They would be perfect for weight loss and quick liquid meals on the go. What a great review. Thanks, for sharing the benefits of each one. These sound amazing! Right up my alley. I’ve been on the look out for an Organic Raw Cacao Powder, so I’ll have to check out this brand. I love products like these! I do however, need to make more of an effort to make healthy smoothies and think these would be great to try! These do sound amazing! I’m keen to try them as I love making smoothies. These sound fantastic, I’ve just gotten a new protein powder so these could be a fabulous addition to that! Super convenient way to be healthier. Omg these all look and sound so good and healthy. I’ve been making blueberry spinach smoothies almost every morning after workouts and it’s delicious and it feels good to eat something healthy. I’m on the same boat as you, now that I have a child I find myself leaning more towards clean eating not only for him but for myself too. I love it. Omggg. How i wish i could have them here. Willing to try! I’m a huge smoothie fan so will check these out for sure! honestly never tried nothing like this. but I LOVE SMOOTHIES!